Sometimes in life, we find ourselves stepping back and asking “why do I keep doing this?”, “why does this keep happening?”, or maybe "why can't I get past this?". We assess and analyse, identifying certain elements that we determine lead to the current situation and resolve wholeheartedly to avoid the same or change our behaviour to ensure we never end up in the same place again. Patterns have a way of repeating themselves, it’s part of the natural order. They can be as simple as those that appear in the petals of a flower or as complex as the patterns made by planets as they track through the heavens. Overwhelmingly, nature’s patterns give rise to much beauty in the world. They can be amazing and inspiring. Conversely, in human behaviour patterns can also be limiting and destructive. Whether you recognise it or not, if you are feeling stuck then it is likely that repeated patterns have led you there. We are energetic: systems of meridians have been accepted and practiced for 5000-6000 years in Chinese, Egyptian and Indian medicine - three separate and distinct civilisations all mapping the same energy pathways. These pathways have been validated in peer reviewed clinical trials to elicit a range of therapeutic benefits. These foundations combine to complete the human experience. Accordingly it takes a combined approach to engage with and address issues in our human experience. It’s time to disrupt the pattern. EFT is your circuit breaker. EFT has been validated as an evidence-based tool in many clinical studies including randomised controlled trials measuring effects for treatment of Post Traumatic Stress Disorder, pain, depression, anxiety and cravings. EFT is part of a group of therapies called energy psychology, as they work with the body’s electromagnetic energy fields. Combining acupressure, exposure therapy and cognitive restructuring, EFT re-conditions your brain and body with positive associations. 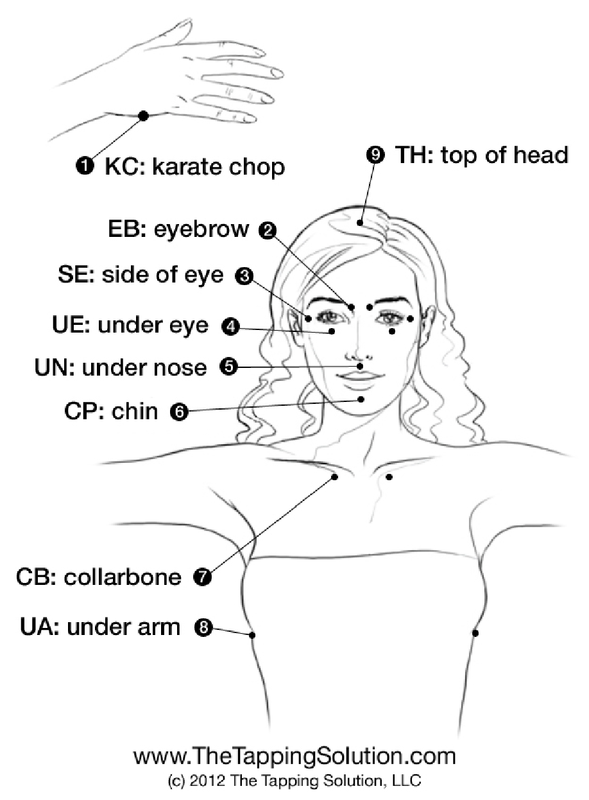 EFT uses stimulation of the end points of the body’s meridians, the same used in Acupuncture for over 500 years but without the invasiveness of needles, as a way of shifting the emotional charge associated with the memories of specific events. There are nine tapping points used in Evidence Based EFT. During EFT you focus on the negative feeling (yep, that’s right) to bring it into consciousness, so that it can be processed. This approach is based in exposure therapy, working on the premise that arousal needs to occur before it can be interrupted. A safe context and environment is critical to successfully working with this technique. With the issue in focus, you rate the intensity of the feelings you are experiencing and identify any body areas that might be associated. Commence tapping whilst verbalising how you feel about the issue, and accepting those feelings. As you are tapping different emotions, pictures or memories arise that will shift the direction of your dialogue, bringing new awareness to the issue. Once all the feelings associated with the issue have been accepted, you can then start to re-frame your relationship to the issue, in order to move forward. Once a comfortable understanding has been reached, stop tapping, take a deep breath and check in with your body to reassess the intensity and felt presence of your feelings. It’s pretty simple. The most important thing to do is to make a start! Honesty: there is zero point in engaging in this process if you are not prepared to be honest with yourself. One of the first things to accept, is that you have told yourself stories - many of them. We all do, it’s a consistent, powerful and enduring coping mechanism. You think you remember all the details of all the events, traumas, relationships that have brought you to this place? And you think those details you remember are accurate? Not a chance. Sorry. The mind is a curious, very protective thing. It is actually very flexible and malleable when it comes to this notion of ‘truth’. It’s the reason that eye-witness testimony is notoriously unreliable……. Courage: Be prepared to dig deep. If you want to shift, then you need to go there. It’s not a case of ‘no pain, no gain’ but there is a reason that aspects of our lives are buried deep in the subconscious. Importance of being specific: it’s vital to identify the specific events that led to the belief / memory that is holding you back now. Building your doterra business - your issues will be your own. General scripts can be really helpful in starting you down the path of understanding your issues, but you will need to identify specific aspects of your own experiences in order to be successful. If you would like to explore how EFT can work for you, then book a consultation call. We can talk abour your needs and see if you'd like to progress. In a therapeutic environment it's important to feel comfortable with the person you are working with, I totally respect that. Engage your body mind and natures chemistry to keep you strong and healthy throughout winter. Use EFT to harness the growth and transformation of pregnancy, birth and motherhood. Children are natural anarchists and they will out your parenting flaws faster than you can say "pass the wine please"! EFT is a great tool for looking inward, identifying beliefs that are driving your behaviour and clearing them out, so you can be the better parent you're meant to be.